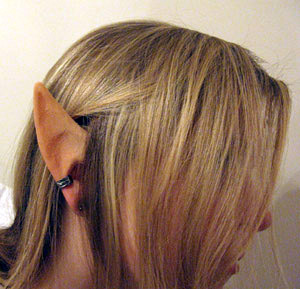 There are two main choices you need to make when purchasing your first pair of elf ears. 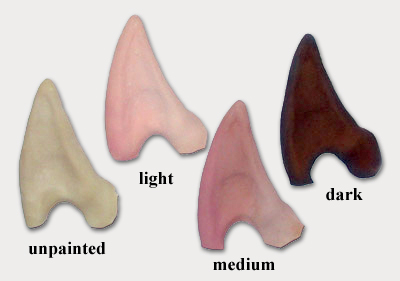 Which style of ears do you like, and what color best matches your skintone?The first mostly depends on what look you are going for. The second can be a little trickier if this is your first pair of ears, so this tutorial should help you determine which skintone is right for you. 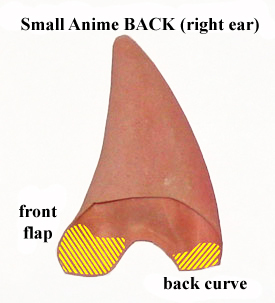 And if you need some pointers on How to Paint Elf Ears, the Aradani Way, just follow the link! Unpainted ears – these are great if you plan to paint the ears a more unusual color, like night elf purple, Drow black, or sea elf blue. Not matter what, if you plan to paint your own ears, make sure the make-up doesn’t contain mineral oil. Mineral oil will break down latex over time. The ideal make-up for painting latex is known as RMG paint (rubber mask grease). Light – this is perfect for those with fair complexions. The ears are painted with the lightest flesh tone that we have Graceful Swan, and have a rose blush painted along the back curve of the ear. Medium – while there may not seem to be a drastic difference between the light and medium, the medium adds a darker flesh tone, great for those with more tanned skin. We paint these with Dark Bronze color, with a highlight of a lighter tone along the front flap, and a touch of rose blush on the back curve. Dark – these work great for darker skintones. The ears are painted a dark brown, using our Milk Chocolate RMG. Unsure of what color ears to buy? If you think you need Dark elf ears, but don’t feel Milk Chocolate is a good match. If you aren’t sure if you are light or medium skin toned, feel free to contact us via our website and we can offer some advice. 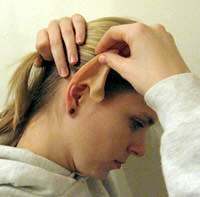 To attach your elf ears to your ears, all you need is a small amount of spirit gum. Spirit gum is one of many prosthetic adhesives available on the market, however we have found that it is the easiest to use, easiest to clean up, and gentlest on the skin. A little bit goes a long way, so when applying it, only use a small amount. We have found that our 1/8 ounce bottle puts on about 100 pairs of elf ears. When attaching your ears, here are the simple steps to transform you into an elf in no time. 1) Apply a small amount of spirit gum to the following areas of the prosthetic, a little on the front flap and a little on the back curve. 2) Being careful not to get any spirit gum in your hair, carefully slide the ear over your own into position. It is usually a good idea to practice doing this in the mirror without spirit gum, until you are able to slide it on easily. 3) Press and hold the two areas for about 1 minute (a little longer if the temperature is lower). I find that the following hand position is the easiest to get a good hold. 4) There are two approaches at masking the ears and making them look more natural. The professional and involved method requires painting flesh latex to hide the seam. Wait until the latex dries, and paint another layer until you have a nice smooth transition from latex to skin. Once the final coat is dry use make-up to paint the area and blend it in.. I used to spend hours applying make-up to hide the seams of the elf ears. Now I use my hair to hide the front flap that attaches to your temple, and use ear cuffs to hide the bottom seam on the back curve. It takes 30 seconds and looks great! If you are wearing the troll or large anime ears, we recommend putting a small dab of spirit gum on the lip of the back side of the ear. Because of their height, this helps prevent the larger elf ears from flipping forward over your ears. If you followed our instructions here, it is very simple to remove the ears. Just grab the ears at the tip, and gently pull away from your head and towards your shoulder. The prosthetics will flip over the ear, and peel off. You can remove any spirit gum residue left on your skin by scrubbing with soap and water. Or if you plan to use the ears quite often, you can use spirit gum remover to more easily remove the residue from your skin. However, if you only intend to infrequently use the elf ears, soap and water should be fine. Never use Spirit Gum Remover directly on your elf ears. Remover is mineral oil based, and will damage the latex if applied to the prosthetics! 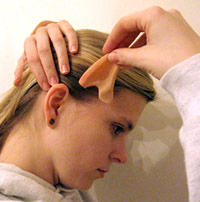 To remove the spirit gum from your elf ears, wait until after about 10 uses of the ears. There should be a nice build-up of spirit gum on your prosthetic. Gently pull on the latex to stretch it ever so slightly. The spirit gum should crack and flake, and you can take your fingernail and scratch it gently to remove it. To avoid tearing your ears, please be gentle when doing this. When you are not wearing your elf ears, keep them in a small plastic bag, such as a ziploc bag. Doing this will protect the latex and help maintain the coloring. A plastic bag will help keep dirt and dust off the ears which will alter the coloring with a grayish tint. 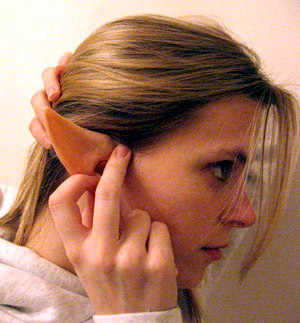 With proper care, your elf ears should last you for years of fun. And if you find us at a Ren Faire or convention, we will gladly put your ears on you for free!